I don’t even want to write this race report, which is pretty indicative of how this race went for me. Sigh. This year was my third consecutive Golden Leaf Half Marathon, and it’s usually one of my favorite races of the year. 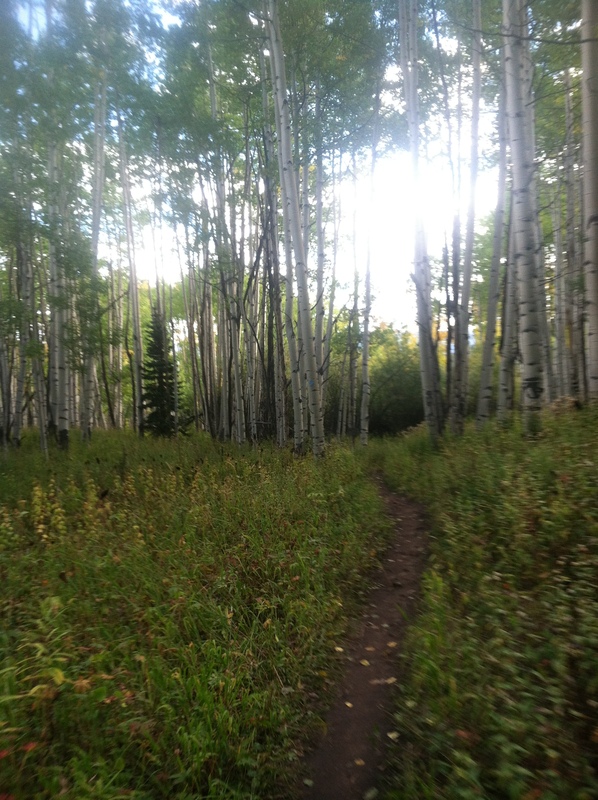 It’s a gorgeous course and I love having an excuse to be in Aspen at the height of golden aspen season. The race also has consistently good technical tees, which is hard to find as a female. You know it’s the little things, like race swag, that really count. Graham and I decided to camp in Aspen over the weekend for the race because camping is fun and free! I had hiked Castle Peak a few years ago and knew that there were awesome camping spots along Castle Creek Road. I had talked to my brother on the phone on the way up to the mountains, and he thought I was crazy for camping the night before a race. As it turned out the only real downside to camping before a race was the fact that our campsite was a good drive up a dirt road and it took about 40 minutes on race morning to get to the start of the race at Snowmass. I made it to packet pick-up with five minutes to spare! 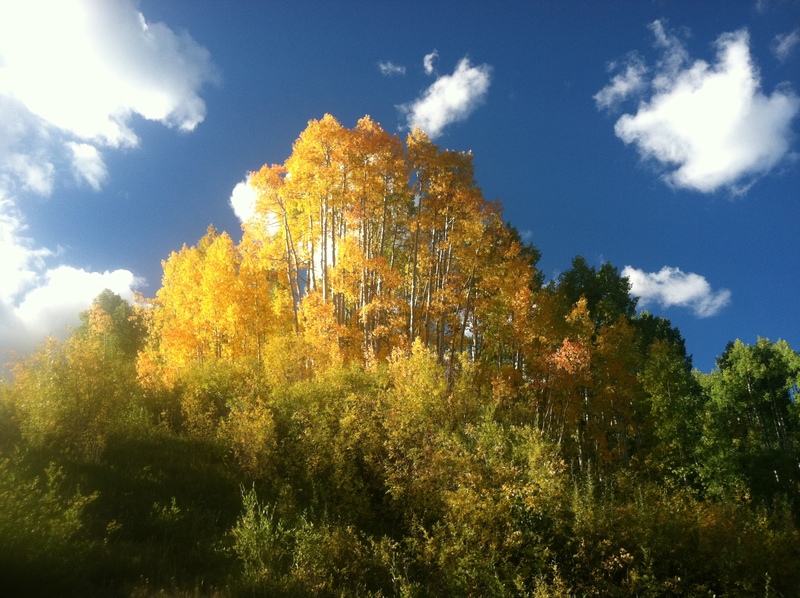 A patch of golden aspens on the race course. I don’t like waiting around at the beginning of races for very long, and Graham and I got to the start with 20 minutes to spare, which was perfect in my book. I remembered from previous years that the start of the race was straight up a ski hill and incredibly brutal. I had hoped that maybe all my training for the Mt. Evans Ascent and the Pikes Peak Marathon would make the hill feel more manageable this year. No such luck. I died, per usual. The first aid station was at the top of the hill, about 1 1/2 miles into the race. I grabbed a cup of water and then was hoping that I would recover on the next downhill portion. It was more like the “Green Leaf Half Marathon” this year. 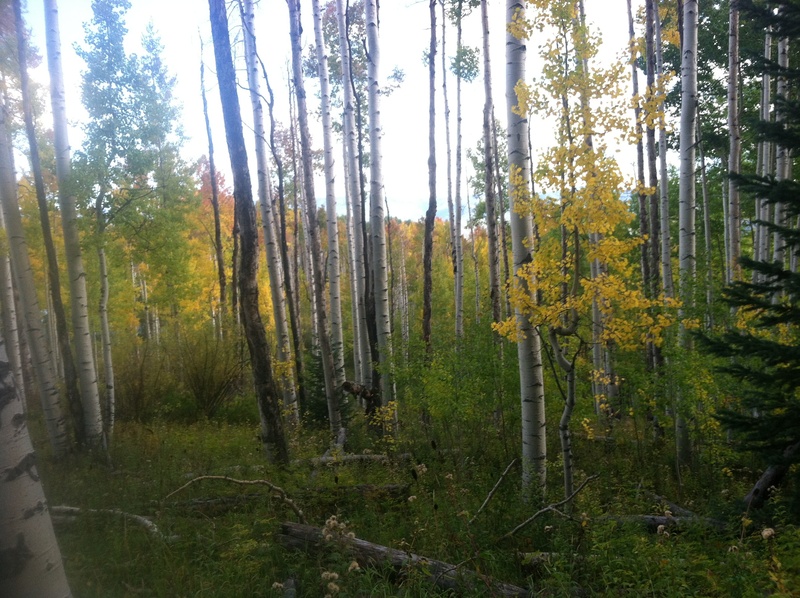 Oh well, the aspens were still beautiful. I didn’t magically recover during the downhill portion like I hoped and instead I felt even more dead. My legs had nothing. I reached the mile 3 marker and I was pretty ready for the entire race to just be over. This was a problem because I still had 10 miles to go. Bummer. Blurry photo on the run! At least the trail is pretty. The next 10 miles were not very fun for me. The trail was more technical than I had remembered, and as much as I tried to lift my eyes from the trail and just enjoy the scenery I had a hard time doing so. I shifted into survival mode and tried to keep moving. I started thinking about the Pikes Peak Marathon and doing the math about how long it had been since that race. I realized it had only been four weeks, and then I cut myself some slack. It was a little ambitious to run a trail half marathon just four weeks after the marathon and expect to feel good. 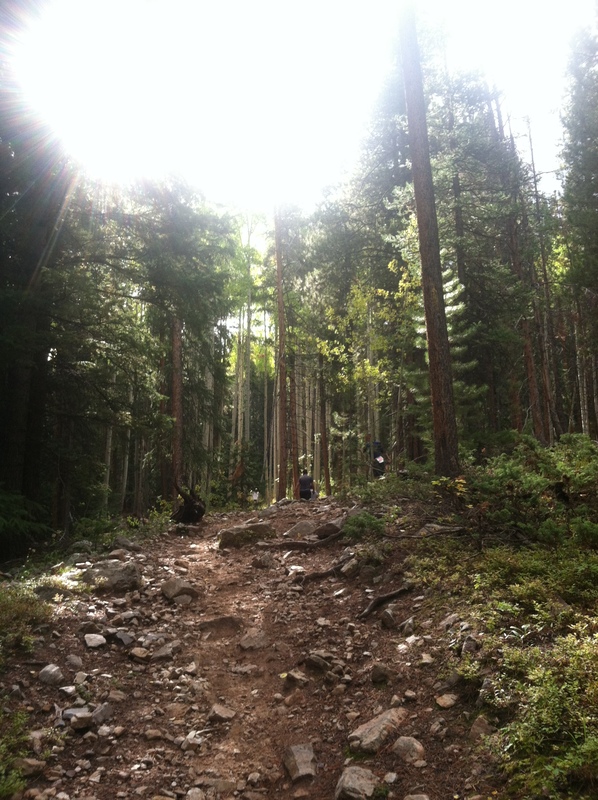 Heading down into Aspen around mile 10/11. The end was near! 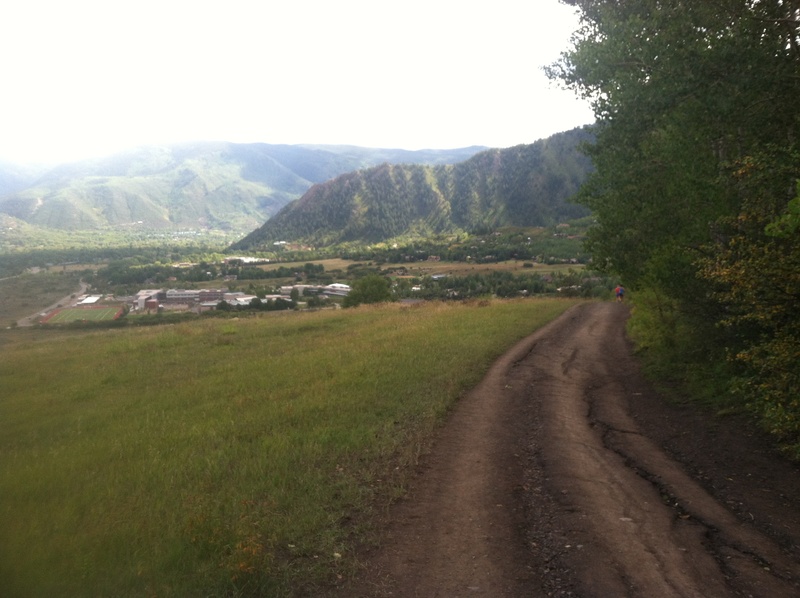 The last few miles of the Golden Leaf course are basically no fun, and wind through the outskirts of Aspen. Some wonderful people were handing out cans of PBR as the course crossed a bridge, and I grabbed one for the finish. Naturally. Finally, I neared the finish line. My time was nowhere near what I had been hoping to get but I was glad to be done. I was sore and tired after the race but eventually managed to hobble with Graham and Cooper to go grab some food in downtown Aspen. Post-race burgers, french fries and beer make all races ever worth it. Even though this year’s Golden Leaf was not a very fun race for me, I was proud to even finish a race so soon after running my first trail marathon. It made me a better runner, whether I liked it or not! (Spoiler: I definitely did not like it.) So okay I didn’t win the race or meet my time goal but I got to spend the rest of the weekend in a beautiful place with Graham and Cooper, two of my favorites. I can’t really be upset about that! 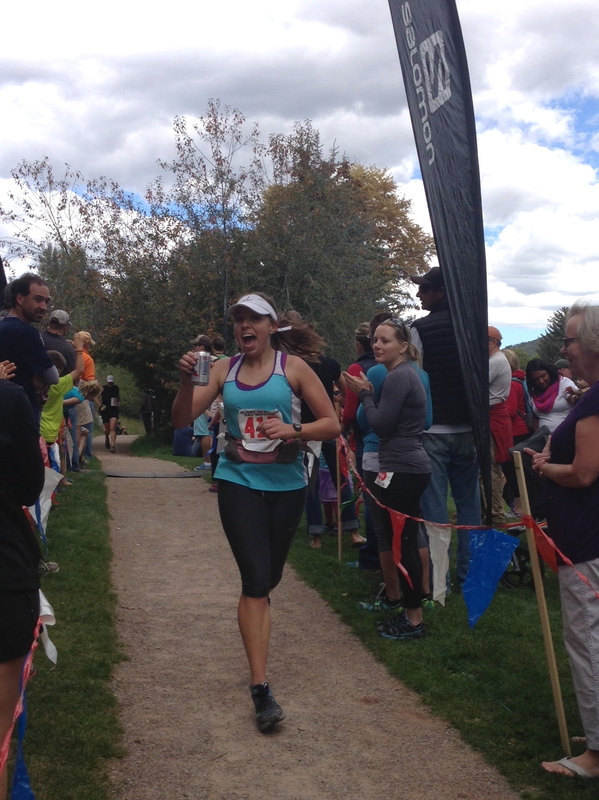 Categories: fall, races, running, trail running | Tags: aspen colorado, fall, golden aspen, golden leaf, race report, trail half marathon | Permalink. The journey begins! Juanary 6.